Bristol Antifascists would like to thank everyone who came yesterday and made sure the EDL got the welcome they deserved. As a local shop keeper said: “Silly bastards!” There was a wide range of tactics shown; we made sure they were hounded all day and that they were driven out of town. 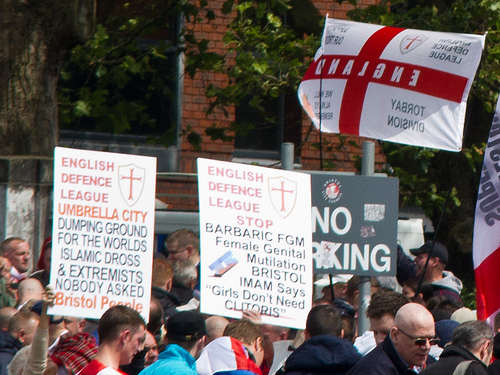 Numbers of EDL range from 250-300 according to online reports. Pretty pathetic for what was meant to be one of their biggest demos. Despite a large mobilising effort in Bedminster, the glory days where they could get 1,500 on th e streets have passed. Clearly the EDL’s days are numbered. Another rainy day, but antifascists were out till late monitoring the activities of the cops and the EDL. They were massively outnumbered. Total of 16 arrests we think, not bad considering the scale of the operation (700 officers). Despite the “exclusion zones” people managed to move around the city with little effort. Burning barricades were erected in Redcliffe as the Police tried to move the EDL out of Queen’s Square. People stood their ground as Police brought out batons, dogs and horse charges to try and disperse the crowd of antifascists. The Police then escorted the EDL back to Temple Meads where they loaded them onto trains and coaches. It was great how folk came together for the solidarity demo outside the cop shop. The police tried it on with a couple more late night arrests in a park when the sound system tried to leave (folks released and NFA).